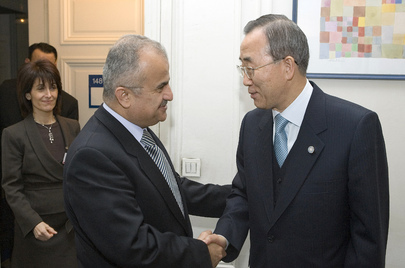 UNITED NATIONS, July 11 -- After briefing the UN Security Council on Libya for more than two hours, Ban Ki-moon's envoy Abdul Elah Al-Khatib emerged to take questions from the press. After he read three points from note cards, Inner City Press asked him about France's admitted arm drop of weapons into the Nafusa Mountains, and if he is still a Jordan senator while functioning as the UN's envoy. Al Khatib to his credit took this question first, saying “since it has been troubling you,” he wanted to clarify that he is a “volunteer,” he is not a UN staff member but it still a “proud” Senator of Jordan. On weapons drops, he called these rumors. Inner City Press followed up that France has acknowledged dropping weapons into Libya. This is up to the Security Council, he said, he is looking for a political solution. Earlier, Inner City Press asked the spokesperson of a Western Council member if in the closed door consultations how Khatib works -- or does not work -- with the UN's full time Special Adviser on Libya Ian Martin had come up. Apparently it did. Ian Martin, despite Ban Ki-moon's spokesperson's office refusal to confirm it, has hired Dartmouth professor Dirk Vandewalle as a “Political Adviser.” Some says the UN's engagement on Libya lacks coherence. Who's running the show: the full time Adviser with the part time unacknowledged political adviser, or the volunteer? As the meeting broke up, French Permanent Representative Gerard Araud was asked, “the Libyan rebels are saying there's been a change of heart by France.” He didn't turn, didn't say a word. He was asked, “Is that a no comment?” No response to that, either. UK Permanent Representative Mark Lyall Grant stopped and said that Khatib told Council members he is waiting to hear back from those he met with in Tripoli. Watch this site.